To give women the most comprehensive and compassionate breast healthcare by placing state-of-the-art technology in the hands of expert breast healthcare doctors and staff. "Excellent, well-coordinated team approach. Calm and supportive in a stressful situation for patient and family." "In my 2 visits to the Elliot Breast Center, I was treated with genuine concern, exemplary professional knowledge and the utmost courtesy by every single staff member I dealt with. Dr. Feldman and Dr. Shikhman both put me at ease with how they discussed my situation, and I have solid trust in their medical skills. Denise, Karianne, Crystal were all wonderful with me - very professional but caring and kind. I would recommend the Elliot Breast Center to any woman. I cannot find the exact positive words to describe the Center. I am extremely impressed with everything about the center." "Dr. Shikhman is an outstanding physician. She exceeds all benchmarks that are associated with her position. 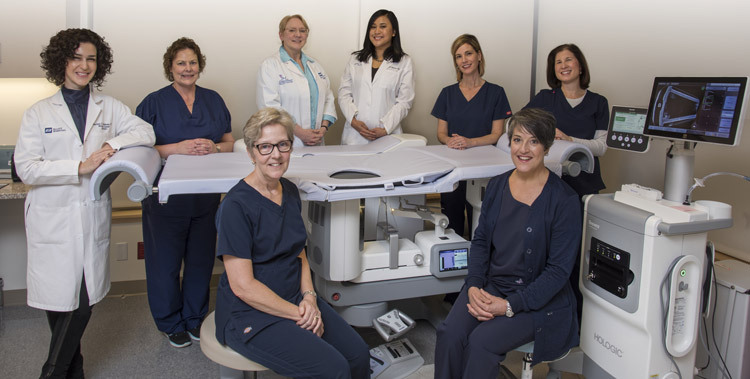 The entire staff at Elliot Breast Health Center is outstanding - they could put on workshops for other practices to learn from them.” "
The Elliot Breast Health Center is proud to offer the most comprehensive care to women in the community... Here, we offer state of the art 3D mammography for your annual screenings. Patients with a high risk of breast cancer are seen in our high risk clinic, and patients that have breast problems are seen in our diagnostic clinic. We know that waiting weeks for mammography results may feel like a lifetime; this prompt and definitive approach allows you to consult with dedicated breast health doctors and staff during your visit. Together, we determine the need for further testing and appropriate treatment options. The Elliot Breast Health Center is Proud to Offer our Services in both Manchester and Londonderry. The Elliot Breast Health Center is proud to be accredited by the American College of Surgeons.